This entry is about raising caterpillars other than Monarchs. (To find out about raising Monarchs, check out my recent blog entry.) It’s fun to try raising different kinds of caterpillars. There are lots of common ones that are as easy to find and raise as monarchs. After you try raising a couple different kinds, you may get hooked on the process! 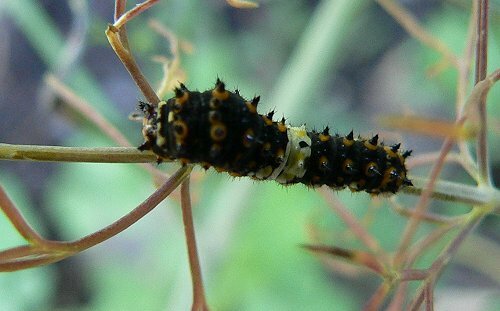 An easy one to try is the Black Swallowtail caterpillar. Black Swallowtails lay their eggs on plants in the parsley family – garden plants like parsley, dill and fennel, wildflowers like Golden Alexander, or weeds like Queen Anne’s Lace. 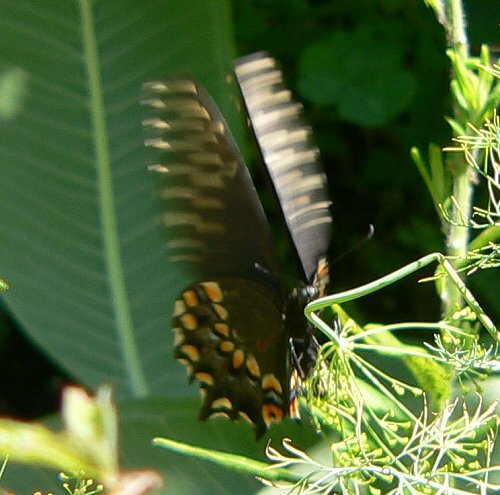 If you see a Black Swallowtail butterfly hovering in a patch of herbs in your garden where there are no flowers, it’s probably laying an egg. Here’s a picture of a Black Swallowtail laying eggs. 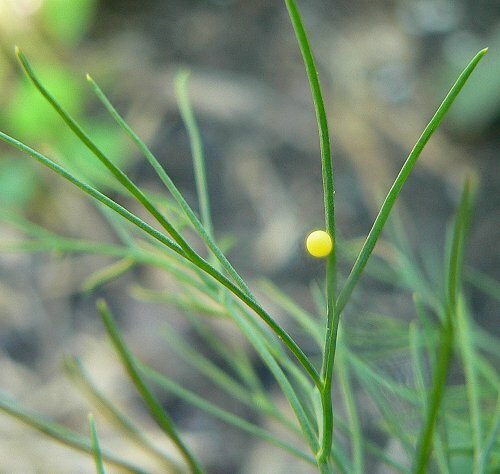 And here’s a picture of an egg on a dill leaf. 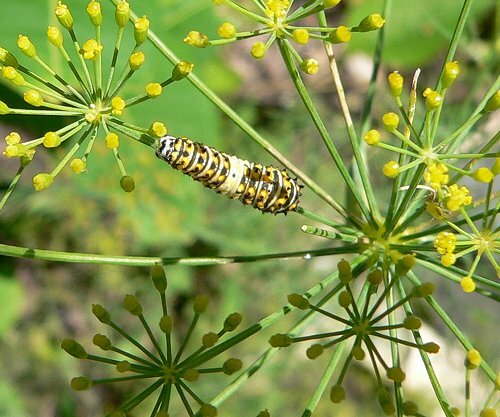 You can bring the egg inside and care for it the same way you care for a monarch caterpillar – except you need to feed it dill or fennel or parsley. 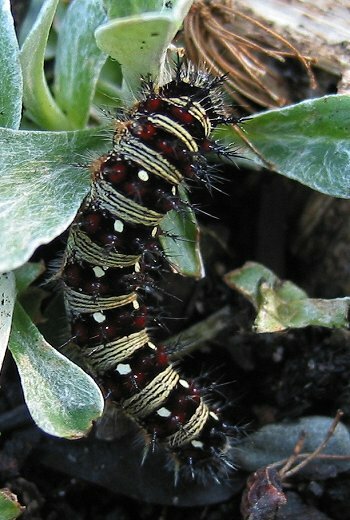 The appearance of Black Swallowtail caterpillars changes a lot in each instar. Here’s a second instar caterpillar. And here’s a 5th instar caterpillar – nearly ready to make a chrysalis. These caterpillars hang their chrysalises sideways from a stick or a plant stalk, so be sure to put a few bare sticks into the cage when they get to this stage. 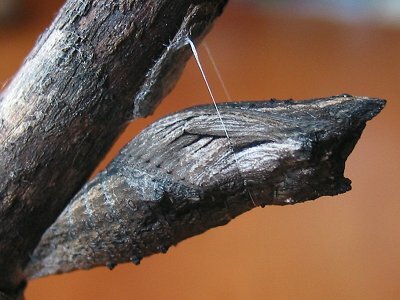 If they make the chrysalis on a dry brown stick, the chrysalis will be brown. If they make it on the smooth green stalk of the dill, it will be green. And here’s a green one. Black Swallowtails go through several generations every year, so if you have a chrysalis in the beginning or the middle of the summer, it will hatch in about 10 days. If you get one late in the summer or early fall, it may not hatch until the spring. To store a chrysalis over the winter, put it in a place where it gets outside temperatures and is protected from rodents. A screened porch is a good spot. If the chrysalis is in a glass container, be sure it isn’t in the sun. If you don’t have a porch, you can sink a clay flower pot into the ground, cover the bottom hole with a flat stone, and put the sticks with their chrysalises inside. Then cover the pot with a clay saucer held in place with a stone. Be sure to take the chrysalises out early in the spring – they will usually hatch in May. Here are several other caterpillars that are fairly easy to find and raise. 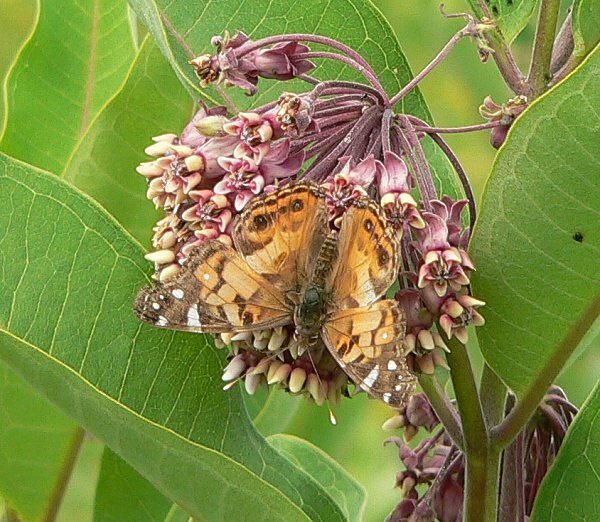 American Painted Lady caterpillars eat Pussytoes, which are a common plant in lawns. If you look at the plants in early to mid-summer, you can often find the little webs that the caterpillars build to protect themselves. They build a web over the top of one branch of the plant. If you spread the leaves apart, you will usually find a tiny caterpillar inside. Here are some Pussytoes plants. Here’s an American Painted Lady caterpillar. And here’s an American Painted Lady butterfly. Painted Ladys look very similar, but their caterpillars eat thistle leaves. These butterflies lay their eggs in groups, and the young caterpillars like to stay together. 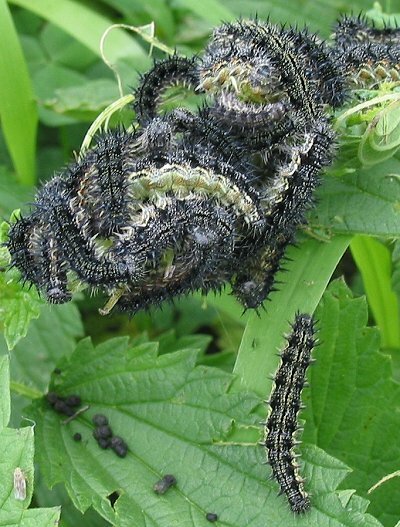 Here’s a group of Milbert’s Tortoiseshell caterpillars. 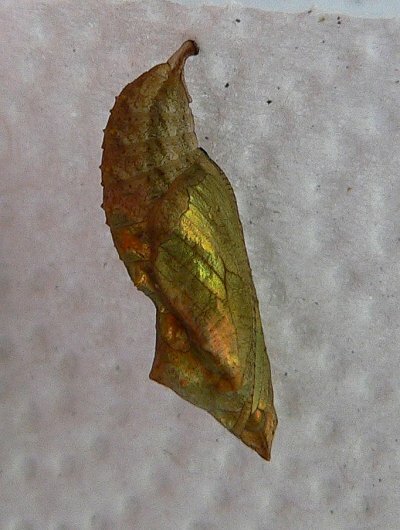 Here’s a Milbert’s Tortoiseshell chrysalis – it looks like a tiny swallowtail chrysalis. Milbert’s Tortoiseshells go through their transformation very quickly – from egg to butterfly is just over a week. 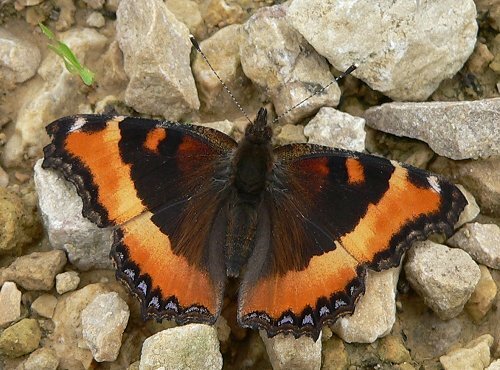 Here’s a Milbert’s Tortoiseshell butterfly. If you find a caterpillar and don’t know what kind it is and want to raise it, be sure to collect some of the plant it’s on. You can keep feeding it with that same plant and watch what happens. 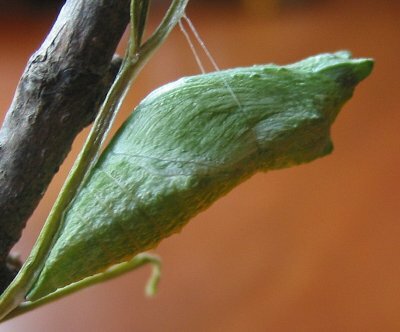 Be sure to give it choices on how and where to make it’s pupa (chrysalis or cocoon). 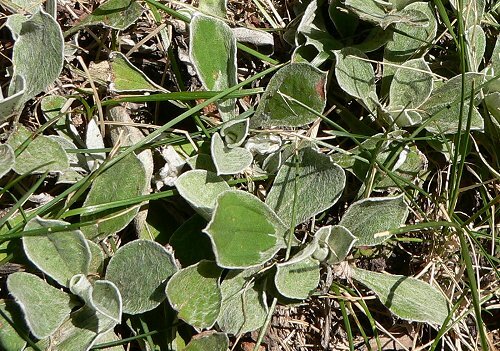 It may use a stick, or it may pupate under some loose leaves or soil. You can put some clean potting soil or wood chips in the bottom of the cage to give it more options.